Traditionally, cholesterol granulomas have been treated by drainage and stent placement via an infracochlear route. Modern thinking and experience shows that while proper preoperative diagnosis remains of the utmost important, CGs may require a more extensive approach for definitive management, with at least partial resection of the cyst wall. There remains controversy on the optimal surgical approach to best address these lesions. Understanding the natural history of these lesions is essential to set realistic treatment goals, as watchful observation is usually the best strategy when CGs are discovered incidentally. However, when these lesions become symptomatic, treatment is indicated, and the only definitive treatment is aggressive surgical intervention. 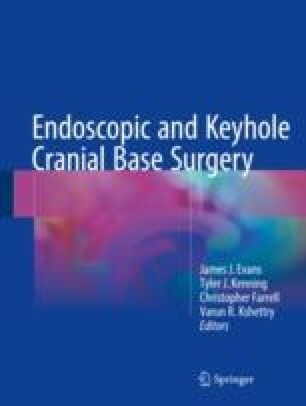 In 19.2, we discuss the open transcranial approaches. The endoscopic management of cholesterol granulomas located in the petrous apex has been developed and improved through the last decades. In 19.3, we discuss the three main endoscopic approaches that can be used to treat these lesions: medial transphenoidal approach, medial approach with internal carotid artery lateralization, and transpterygoid infrapetrous approach. This technique offers the possibility of reestablishing a larger and natural drainage pathway into the sinuses while avoiding the potential complications of transtemporal/transcranial approaches. Samadian M, Vazirnezami M, Moqaddasi H, Rakhshan M, Khormaee F, Ashraf H. Endoscopic transrostral- transsphenoidal approach to petrous apex cholesterol granuloma: case report. Turk Neurosurg. 2009;19(1):106–11; Samadian M, Akbari Dilmaghani N, Ahmady Roozbahany N, Farzin N, Bahadoram M. Endoscopic transnasal approach for cholesterol granuloma of the petrous apex. Case Rep Neurol Med. 2015;2015:481231. https://doi.org/10.1155/2015/481231.